Saturday was my last day working at the winery. It was bittersweet. You know how the saying goes, "if you don't have anything nice to say, they don't say anything"? Well...[silence]. Instead, I will be working three days a week at Kitchen Conservatory in St. Louis. I've taken a few classes at this small cooking school/chef's store, and I've always thought that I would love working there. When the opportunity arose, I jumped at it and was hired by the owner (Thanks again, Anne!). Monday was my first day, and I mostly learned how to operate the computers and process orders. It seemed like a pretty slow day, customer-wise. I spent most of the day yesterday pricing and putting away merchandise. I reorganized a few things, too, (like a shelf of cake pans) which I loved...being that I'm a bit OCD and all. I will be working Saturdays, too, and I am looking forward to busier days. Imagine that! It was actually fun for me to open a shipment of new stuff and help find a place to put it all. The new stuff is from a company called Bambu. Their products are all made from bamboo, a renewable resource, including a set of disposable dishes that are better for the environment than standard paper plates (they decompose quicker). They're sturdier and more attractive, too! Kitchen Conservatory now carries those as well as baskets, platters, salad bowls, spoons, spatulas, and utensil holders. It's cool stuff! Anyway, when I got home Monday evening, I wanted to make something simple for dinner. 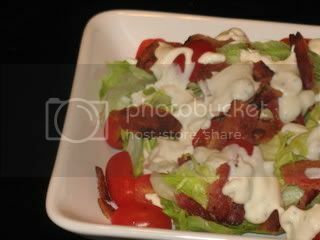 I had some iceberg lettuce and grape tomatoes on the verge of expiration in the fridge (along with a small hunk of gorgonzola leftover from those tartlettes), so I decided to put together a classic wedge salad of crispy bacon, lettuce, tomato, and homemade bleu cheese dressing (a first for me). What do you do if you don't have a recipe for bleu cheese dressing? You wing it! I just crumbled up the cheese in a bowl, added a couple spoonfuls of mayo, stirred in a few splashes of heavy cream, and seasoned with black pepper and garlic powder. The dressing was thick, almost more like a dipping sauce than a salad dressing (but, I dug it!). You could add more cream if you want a thinner consistency. Be sure to check the seasoning before serving.